Hands-on with the Early Access racing sim. It makes sense, then, that the developer of Assetto Corsa is the one making the official game of the 2018 Blancpain GT Series. 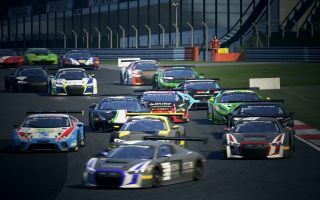 Released in Early Access last month after a few beta phases, Assetto Corsa Competizione's offering at the moment is barebones in the extreme: one car, one track, and some AI drivers for company. It's enough to give a glimpse of what's to come, which is the kind of structured solo championship racing the original Assetto Corsa never really managed. But it is a glimpse: unless you're really passionate about helping Kunos Simulazione develop the game by delivering detailed and regular feedback as the product takes shape, taking a GT-spec Lambo around the Nurburgring is going to hold limited interest. That's not to say the fundamentals aren't in place. With a force feedback wheel clamped to your desk, Competizione offers one of the more convincing trackside adventures in all of racing simming. The physical model obviously shares a vast amount of DNA with the original Assetto Corsa, which means the line between being in control and out of control of your vehicle is woolier and scarier than it is in the ultra-responsive Project CARS 2. Any degree of oversteer or traction loss is terrifying in its Blancpain cars, not because the wheel snaps around like a wayward bronco, but because you're never sure when you might have lost the back end for good. Is it better or worse than other racing simulations in physical terms? Ask a professional Blancpain GT driver. What I can say is that it offers enough challenge for you to own every fast sector and overtake, and enough feedback for you to understand why you're now in the gravel trap, swearing at a procession of sponsor-laden supercars buzzing past. Whether you locked up the brakes, lost traction, unbalanced the car or short-shifted, the haptic and audio feedback's there to teach you why it happened. While we're on audio, particular plaudits should go to your race engineer, who delivers information over race radio with authentic levels of awkwardness and detachment. He really schools the F1 series’ Five Live DJ voice who talk you through each race, and is the highlight of a great sound mix that includes convincing gravel rattling in your wheelhouses, trackside PA systems blaring out victory music, and truly frightening thuds when contact's made. Visually it occupies that same rarefied air of the original AC and of Project CARS, where every headlamp's reflection has been lovingly realised, every sponsor logo appears crystal-clear, and driver arm animations sell the heft and hardship of coercing a GT car through corners at high speed. The in-helmet view is the best I've ever seen of its type, perfectly nailing the G-force effect. It's a neck workout in its own right. Your cunning doesn't get much of a workout from the AI though. They're as pacy as the difficulty slider dictates, but they're rarely seen jostling for position or taking different lines into a turn. This being endurance racing, perhaps they're simply an attempt at authenticity, but at this stage of development they feel… well, artificial. That's the story for those with a racing wheel: robust if limited sim racing with a crunchy learning curve and some memorable endurance racing around Nurburgring. For gamepad racers, and the six people still using their keyboards to control vehicles in videogames, it's a rather rougher experience at present. Those control methods have yet to be implemented with any great finesse, so tapping the left analog stick one way or another results in great sawing actions on the steering wheel that destabilise the car and effectively impose an ‘Inebriated’ mode, a bit like Nico and Roman's drives home after an evening of beers and bowling in GTA 4. This being Early Access, success or failure is an ongoing narrative for Competizione. Only the truly dedicated need bother getting in on the ground floor right now, but anyone with a soft spot for an official racing license, however esoteric, will eventually be rewarded by Competizione's stern and authentic racing. It feels similar enough to its predecessor that you wonder whether this might have made more sense as an expansion, but as the roadmap's ticked off and multiplayer racing is introduced, there should be enough here to sustain a small but dedicated community.